Donna Phelan back again! Today I will be sharing a Masculine Birthday card with you. I die cut 3 of the Starfish from the Sand Dollar And Starfish set by Cheery Lynn. Check out the texture on them, perfect! I also sponged the edges a bit using Antique Linen ink. I then placed them on top of the Distress Windham Collage opening, almost looks like they have been caught in fish net. 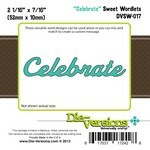 I layered the Curly Word Celebrate from Die Versions 3 times to create a chipboard like accent. That particular die is no longer available but check out this one out, same great die, affordable price! What a wonderful masculine card Donna! I love the blue and white and your beautifully colored light house. Thanks for the great masculine inspiration! Oh Donna this is absolutely GORGEOUS! LOVE your use of dies and so fitting for your area! Wonderful inspiration for a masculine card! GREAT job! Beautiful card with a lot of white space that is used perfectly with the stamp. Love your sand dollars! Oh Donna that is just too cool, I love how you achieved such a realistic look to the starfish and a great border die to go with them, excellent coloring and addition with the lighthouse! I love this card! I want these dies NOW! what a wonderful job!